After covering the environment and specifically water issues in the West, why write a book about the topic? What surprised you? There’s a narrative of doom in the non-fiction literature of the West—a narrative most famously laid out by the great Marc Reisner in his classic Cadillac Desert. The story is that our unwillingness to come to terms with the overbuilt farms and cities of the arid Southwest would, in the words of one author I quote in the book, “catalyze an apocalyptic collapse of Western society.” For many years I was a part of this narrative tradition, writing newspaper stories about dwindling snowpacks and dropping reservoirs as climate change dried up the West. But even as conditions worsened over the last decade, I found a remarkable adaptive capacity as communities learned to not only survive but to thrive with less water. I found stories of farmers switching crops and fallowing land to do more with less water. I found cities tearing out lawns and installing new low-flow fixtures. As the water supply shrank, I realized that when people have less water, they use less water. You write in the book that you want to dispel myths about water in the West. How did thesemyths come about? Why do they matter? How do they actually affect the way we manage water? In the book, I quote geographer Daniel Grant, who writes about a “genre of apocalyptic prophecy” in American writing about water and drought. Those stories of a “human misalignment with nature,” and of punishment for that sin, resonate with the dominant narrative about life in the arid West. But I’ve seen a different story. Standing in the dry bed of the Colorado River down the hill from the Mexican city of San Luis in the spring of 2014, it was hard not to be hopeful. There, residents of the community gathered to watch a pulse of water arrive, an experiment in international cooperation to return water to an ecosystem and communities left dry by water use upstream in the United States. Seeing water users come together in the midst of a drought to share that water was a life-changing moment of hope. The myths of conflict and apocalyptic doom stand in the way of our ability to learn from and embrace those moments of hope. News about water in the West seems to be pretty dire but you are hopeful in the book. What gives you that hope? 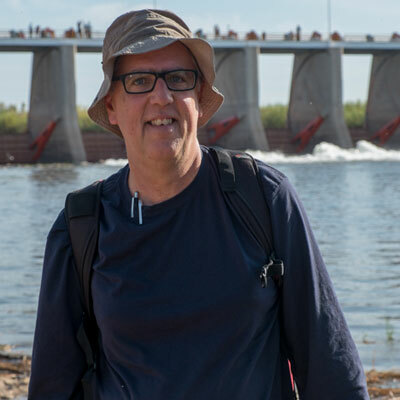 The story of the arrival of water in the dry bed of the Colorado River at the San Luis Bridge in the spring of 2014 is just a small part of a much larger story that gets lost in the rhetoric over our water troubles. In my home town of Albuquerque, per capita water use has been cut in half since the mid-1990s. We now have more people, using less water. In the midst of a persistent drought across much of the 21st century, our aquifer is actually rising. In Las Vegas, water use peaked in 2002, and has dropped by 33 percent, even as the city’s population has grown by 600,000. In Imperial Valley, the largest farming region of the Colorado River Basin, water use has declined by more than 20 percent since the early 2000s, while agricultural productivity has risen. Over and over, communities find that when they have less water they use less water, and not only survive but thrive. Seeing that adaptive capacity provides hope for the difficult times ahead. You detail many good news stories about water in the West in the book. Why aren’t these stories more well-known? Is there one example that stands out for you? Journalism’s norms are geared toward finding problems, pointing fingers of blame, a watchdog culture that grew out of the Watergate era. During California’s deep drought of the last five years, we saw story after story in national and international media about the little community of East Porterville, where residents’ wells ran dry. Yet the fact that reporters looking for a story of doom kept returning to this one town suggested something important – most communities weren’t running out of water. A community not running out of water is a much harder story to tell. In the fight for readers’ attention, the extraordinary trumps the ordinary. Yet if we are to really understand our water problems, and what their solutions might look like, those “ordinary” stories of communities not running out of water matter. In the book, I tell the story of Las Vegas, an extraordinary city in the desert that, framed in the apocalyptic narrative, seems doomed. Yet over the last two decades, Las Vegas built a remarkable level of resilience into its water management – dramatically reducing its water use, storing years’ worth of excess supplies underground, building new infrastructure to ensure that it could still get water from Lake Mead even as drought and climate change shrink the great reservoir. Las Vegas has more to do – no doubt it is only part of the way down the conservation path it needs to travel. But it has demonstrated the adaptive capacity to respond to the risks it faces and ensure its future. In your experience, what is the key to more sustainable water use in the West? It sounds hokey, but we need to learn to get along rather than fighting over water. 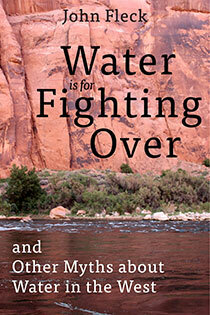 In the book, I tell the story of environmentalist Jennifer Pitt and Arizona water manager Sid Wilson. They were enemies until they ended up on a float trip together on the Colorado River. By the end of the trip, a bond had developed that led to a series of agreements that brought water managers and environmentalists together to try to find ways to meet the needs of both, laying the foundations for what eventually brought the river flowing back through San Luis a decade later. We need to recognize that we all can get by with less water, that we don’t need to fight to preserve our current share of a shrinking supply. We can’t all go on river trips together (much as we might all benefit), but we need to recognize that to build the complicated sharing arrangements needed in our transition to a collaborative, cooperative water management future, we need to invest in the human infrastructure – the networks of governance needed to make the deals to share our water in the future rather than fight over it. This is one of the key insights of Elinor Ostrom, the Nobel laureate whose work on water sharing lays the foundation for much of what I write. Most importantly, a sense of hope about our ability to overcome the challenges Marc Reisner so ably laid out in Cadillac Desert. But actually overcoming these challenges takes more than hope, which is why the stories of what success can look like – how Las Vegas cut its water use, how Jennifer Pitt and Sid Wilson found a way to provide water to cities and the environment, how the lettuce farmers of Yuma found a way to use less water while providing us a growing bounty of winter vegetables – are so important. We need to know that it is possible, and we also need to see examples of how it can be done. That is what I hope this book provides.